This luxurious estate home is tucked away between Cotton Lane and Old Hillsboro Road off of Del Rio Pike. 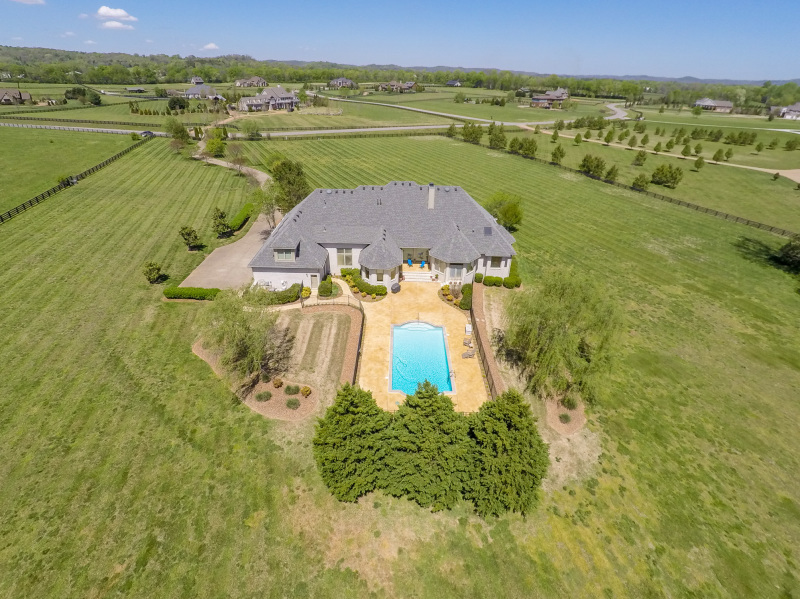 Living is easy in this impressive, spacious residence with waterfront access to The Little Harpeth River and 10-plus acres of sprawling land. This luxurious estate home is tucked away between Cotton Lane and Old Hillsboro Road off of Del Rio Pike. 4216 Two Rivers Lane in Franklin offers you a sophisticated yet restful retreat but also has convenient access to Downtown Franklin, Leiper’s Fork, Cool Springs, Green Hills and Belle Meade. This magnificent residence is graced by soaring ceilings and the wall-to- wall windows are a haven for gazing at the pool and vast acreage views from multiple vantage points. The grand entryway draws you into a voluminous layout made for entertaining. The gathering room immediately grabs you and flows seamlessly into the tremendous kitchen. A vaulted, wood-stained, bead board ceiling is a dramatic focal point in the eat-in kitchen with views of the gorgeous backyard. The kitchen is accompanied by an elegant formal dining room and den/family room with impressive built-ins. The divine master suite is the ultimate retreat, which presents massive windows, vaulted ceiling, sliding doors to the gorgeous patio, and an opulent ensuite bath with skylights, plentiful recessed lighting, yoga/exercise area with engaging views and a master closet you have dreamed of. The one-level living floorplan encompasses four spacious bedrooms with plenty of room for study, sleep and storage, four luxurious bathrooms, and three generously sized half baths. The masterfully designed laundry room can be an escape in itself with its spacious room for folding and sorting clothes, craft/hobby area and work/desk area. The vast, unfinished basement allows limitless possibilities based upon your needs. Perfect for a wine-cellar, full media/theater room, additional storage areas, batting cage, etc. The upstairs bonus room is the perfect, hideway hangout space for kids/teens or additional hobby space. This home is ideally positioned to enjoy all the seasons. Spring and summer will offer beautiful sights of plentiful green foliage, spring blooms, and vast space to enjoy all that the outdoors has to offer. With the Little Harpeth River in your own backyard, you can enjoy canoeing on the river, fishing or simply relax and sit by the waterside. Hike through the woods and enjoy the glorious, eye-pleasing fall foliage and colors that Middle Tennessee brings in the autumn months. 4216 Two Rivers Lane is zoned for Grassland Elementary, Grassland Middle School and Franklin High School. The 4 bedroom, 8 bathroom, 5,650 square foot home is exclusively listed by Wes Postlethwaite and Tara Ward with the Diamond 5 Group and Keller Williams Realty. The Diamond 5 Group is one of the Top 5 Groups in the Keller Williams Franklin office. To schedule a private tour of this luxury home or to find out how The Diamond 5 Group can uniquely assist you with your Real Estate needs, please call 615-545- 4772.